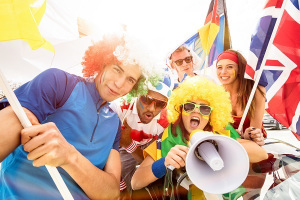 With the FIFA World Cup just one day away, we thought you might like to brush up on (=improve what you know about) your tournament vocabulary. Let’s start by getting up to date. The qualification phase ended in November 2017. In this period, the various countries’ national teams played against each other in order to qualify for (= succeed in getting into) the tournament. From a field of 211, a total of 31 teams qualified, ‘field’ here meaning ‘all the people or teams in a competition’. As always happens, the host nation (= country where the World Cup takes place – this year, Russia) qualified automatically. The resulting 32 teams were put into eight groups of four teams.